When Xbox Music goes live tomorrow on the Xbox 360, console owners will be the first to access the Spotify-esque service from Microsoft. Well, some of them will at least -- existing Zune Pass subscribers (now an "Xbox Music Pass") and folks willing to pony up $9.99/month or $99.90/year who also have an Xbox Live Gold account gain access to Xbox Music's 30 million global song database via data stream (18 million songs for those of us in the US). Okay, okay, a free trial is available for 30 days. After that, though, 360 owners lose access unless they pay up. Then, on October 26, Windows 8 PC and tablet users get the service for free -- with or without the Xbox Music Pass -- albeit with ads laced in. Windows Phone 8 is in the same boat with Xbox folks: no song-specific streaming without an Xbox Music Pass. That won't arrive until some time "soon after" the PC/tablet version. Microsoft says the ad-supported free streaming is unlimited on PC and tablet, but that's only for the first six months, after which it becomes time limited. A bummer for sure, but Microsoft's banking on you digging the service enough to snag an Xbox Music Pass. But will you? Like with Spotify and Pandora, some basic artist info, album/song info, and images garnish playing tracks, though not all artists are created equal -- some artists had no images, while others had a detailed dossier. Microsoft says it's adding more all the time, though. Xbox Music Pass holders can hang on to tracks for offline listening as well, which show up in your library and can be added to playlists. And should you wish to listen to a "Smart" radio station based on an artist/song/album, you can employ the "Smart DJ" (previously "Smart Playlist") to create just such a station. The whole shebang is tied directly to your Microsoft login, mirroring settings and library data on all your devices (Xbox 360 included) across the cloud. That same concept applies to playback, as you can pause a song on one device and pick it up right where you left off on another. Songs can also be purchased through the streaming service with or without the Xbox Music Pass, should you really want to hold onto that Barry Manilow track. The tile and pin design is nigh identical across all Xbox Music platforms -- the now commonplace Microsoft Helvetica against contrasting colors, with content occasionally arranged in sets of tiles. On the Xbox 360 it runs sluggishly, plodding through each menu as the aging hardware is wont to do, though Kinect voice commands help alleviate the feeling of lag. That situation thankfully doesn't apply on tablets and smartphones, at least on the two unnamed devices we used. Navigating content is relatively easy and intuitive, with the touchscreen offering the easiest accessibility -- the Metro UI really begs to be used with a touchscreen device. Unlike its PC, tablet and smartphone brethren, the 360 version of Xbox Music isn't capable of being used in the background while executing other applications -- everything else aside, this is the service's most glaring flaw. Though some folks may navigate to the Xbox Music application and launch it just to catch up on some tunes, the inability to plug that music into a game experience is a massive oversight. Considering that functionality already exists for music stored on the 360's HDD, it's hard to understand how this doesn't carry over to the company's new flagship music service. Xbox Music is the next big push for Microsoft, and it launches first on Xbox 360 tomorrow -- replacing both the "Zune" name and Windows Media Player in one fell swoop (the second death of the Zune, if you will). Windows 8 tablets and PCs get it at launch on October 26, while Windows Phone 8 gets it "shortly after." The service is also heading to unnamed other platforms, says Microsoft, "at a later date." When fully launched, Xbox Music and its store will comprise 22 regions worldwide, and the free streaming service for tablet and PC is headed to 15. Microsoft anticipates adding additional regions "throughout the coming year." Enjoy your favorite music from a 30 million-song global catalog powered by the one service that integrates your music experiences across your tablet, PC, phone and TV. All the music you love, every way you want it. REDMOND, Wash. - Oct. 14, 2012 - Today, people need to use multiple music services to get exactly what they want. There are download-to-own music services, Internet radio services and subscription services that allow you to consume all the music you want. But, as more music services have emerged, it's become harder than ever to enjoy the music you want - and to experience it the way you want it, on any device. Whether it's music you've purchased on your smartphone, a music app on your tablet, listening to songs through the living room TV or turning to Internet radio on your PC at work, the music you love is scattered across different services. Enjoying music today requires too much work. To solve this problem, Microsoft Corp. is introducing Xbox Music, the first all-in-one music service that gives you the freedom to stream custom-created playlists for free, subscribe to all the music you want or download-to-own your favorite songs. Through the power of the cloud, it effortlessly integrates the music experience across your tablet, PC, phone and TV.1 With more than 30 million songs in the global catalog, Xbox Music begins rolling out around the world tomorrow on Xbox 360 and later this month on Windows 8 PCs and tablets and on mobile phones, starting with Windows Phone 8 at launch and additional platforms later. • Free streaming1 music on Windows 8. Enjoy on-demand access to tens of millions of songs for free on all Windows 8 tablets and PCs. Discovering and enjoying free music on Windows 8 is as easy as typing an artist or song name and hitting "play" - songs are instantly available to stream and for you to create an unlimited amount of playlists. • Xbox Music Store. Want to own the music you love? The Xbox Music Store is a comprehensive MP3 marketplace giving you the opportunity to purchase a single track or entire album on your Windows 8 tablet or PC and Windows Phone 8. • Smart DJ. Creating a new form of artist-based radio, the Smart DJ feature is a quick and dynamic way to personalize your collection, discover new favorites and create ultimate playlists by launching instant mixes based on your favorite artists. With unlimited skips and a view of the full recommended music stream, Smart DJ puts you in control of your Internet radio experience. • Cloud Storage. Available in the coming year, a scan-and-match feature will take you beyond the 30 million tracks globally offered through Xbox Music. 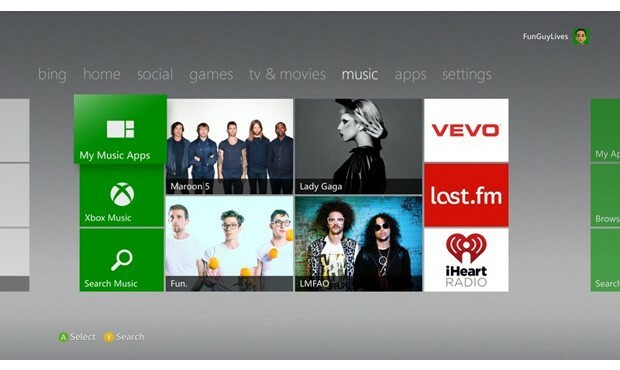 It will add all the music you own to your Xbox Music cloud catalog, including music acquired through other services. This means you can add any content you have to your personal Xbox Music collection, even if it's not available in the Xbox Music catalog. Xbox Music isn't just a listening experience that shows your tracks in spreadsheets and lists. Taking full advantage of every screen on which you enjoy music, Xbox Music elevates your music experiences with striking visuals. As you listen on your tablet, PC, phone or TV,1 your screen comes to life with artist photos, bios, cover art and discography. The ubiquity of Xbox Music is powered by the cloud. 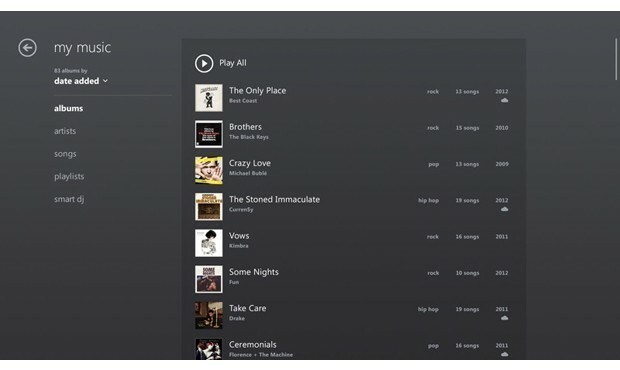 Whether it's free streaming2 on Windows 8, a subscription on Windows Phone 8 or tuning into a playlist on Xbox 360 - each experience is cloud-based for immediate access to your entire catalog, making music management simple. With the cloud sync feature, your favorite playlists are no longer held captive by the individual device on which they live. For Xbox Music Pass subscribers, you can create the perfect playlist on your Windows 8 tablet and see it automatically appear on your Xbox 360 or Windows Phone 8. Xbox Music launches with a global catalog on par with iTunes, offering 30 million tracks from some of the leading music labels around the world. It will be pre-installed as the default music player on all Windows 8 tablets and PCs and on Windows Phone 8 smartphones, and it will be part of the 2012 console update for Xbox 360. Free streaming1 on Windows 8 tablets and PCs launches Oct. 26 in 15 markets worldwide. Xbox Music Pass will be available for Windows 8 and Windows Phone 8 in 22 markets worldwide; it will begin rolling out tomorrow on Xbox 360 in the same markets. Xbox Music Store will also be accessible on Windows 8 and Windows Phone 8 in 22 markets worldwide as devices become available. Microsoft will continue introducing Xbox Music in new regions around the world throughout the coming year. Xbox is Microsoft's premier entertainment service for the TV, phone, PC and tablet. It's home to the best and broadest games, as well as one of the world's largest libraries of music, movies, TV and sports. With Kinect, Xbox 360 transformed gaming and entertainment in the living room with a whole new way to play games and find entertainment - no controller required. More information about Xbox can be found online at http://www.xbox.com. 2 Pricing will vary by region.